After LG Mobile Philippines announced the availability and price of their latest Android smartphone LG G2, one of our leading telcos offer this handset on their postpaid plan. Get it first at Globe Telecom for only 1799 pesos per month at mySuperPlan that comes with free unlimited LTE internet surfing, free network services and free gadget care for 1 month. Enjoy this amazing features of LG G2 first from Globe Telecom best ever mySuperPlan, customizable plan based on your desired network services bundles and booster. With you Plan 1799, you’ll automatically get equivalent peso value that you can spend for a gadget, call and texts combos and remaining consumable. You don’t need worry with this gadget for the first month as you got a free 1 month Globe Gadget Care. For more details visit http://www.globe.com.ph/postpaid. 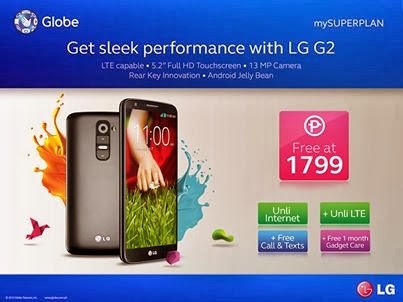 really amazing a G2 at plan 1799 plus unli internet surfing and more..
amazing features of LG G2.globe offers such great deal for plan 1799 i can have my own G2 phone.love it!